Residents of South Winnipeg were shocked to see a funding cut of $6.4M for new recreational facilities, and no proposed funding for a South Winnipeg recreation complex in the budget for the next 6 years. City budgets are about setting priorities within a limited amount of funding. This year’s budget priorities were determined by the Mayor, his Deputy and Acting Mayors, and members of his Executive Policy Committee (EPC). The Mayor and EPC stated the $6.4M cut was because the Province of Manitoba cut recreation funding, and it wasn’t the City who cut the funding. Recreation is a City responsibility, not a Provincial responsibility. While it was interesting to hear yet another reason for no funding for recreation in South Winnipeg, residents have heard just about every reason in the book as to why no land was set aside for a recreation complex, why no funding has been allocated, and why no mayor has prioritized the development of a recreation facility. In response, the President of South Winnipeg Community Center organized representatives from South Winnipeg Action Team (SWAT) to speak to the Mayor and EPC on December 5, 2017 to request that recreation in South Winnipeg be prioritized in the City’s 2018 budget and over the next 6 years. The South Winnipeg Community Centre rented a bus to drop off and pick up residents. Neighbourhood Associations shared the message to residents throughout South Winnipeg. 24 people registered to speak and 20+ residents submitted presentations. I spoke to the Mayor and EPC (my presentation) and made a request to amend the Preliminary 2018 Budget with recommendations to ensure recreation in South Winnipeg was prioritized. In total, many of us spent over 9 hours at City Hall making presentations. On December 8, the Mayor and EPC voted to include the recommendations and amendments to the 2018 budget. This amended budget will be voted on by City Council on December 12. I fully expect the 2018 Budget will be passed. I think it is beyond ridiculous residents had to take a day off to go to City Hall and tell the Mayor and EPC that over 60,000 people in the South Winnipeg Community Centre catchment area need recreation facilities. What this really tells me is that we will likely have an uphill battle for the future and need to continue ensuring this is a priority for every Mayor and City Council until the recreation complex is built. In summary, I want to extend huge gratitude to the South Winnipeg Community Centre for organizing residents, as well as many thanks to the many residents who could who submitted presentations. It is important to have a City Councillor who works hard for ward residents, but it is just as critical to have passionate residents that can come out and speak to important issues on behalf of the community. Again, thank you for your tremendous support on this very important issue. My thanks to The Sou’Wester for reporting on this story. Members of southwest Winnipeg community groups appealed to the city’s executive policy committee on Dec. 5 to commit capital funds for a new recreation campus in the 2018 budget. 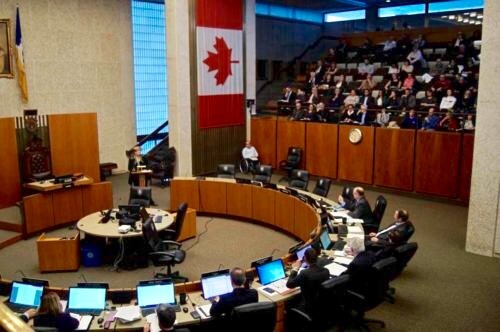 The Winnipeg City Council chamber gallery was filled with community leaders from Waverley West (including Osaed Khan, president of the Manitoba Islamic Association, and Bob Roehle, president of Pembina Active Living 55+), members of local residents’ associations; and South Winnipeg-St. Norbert city Councillor Janice Lukes, all asking for the city to earmark capital funds to build a rec centre south of Bridgwater Forest. Residents appearing as delegates on the issue had organized buses to bring people downtown to participate. The city has identified a recreation deficit in the area, at about .67 square-feet of heated recreation centre per person. The mandated average is 1.88 square-feet per person. Currently, the South Winnipeg Community Centre does not have gym space and relies on agreements with the Pembina Trails School Division for access to school gyms. About $4 million has been set aside to purchase land for a recreation campus, and an additional $12 million is designated to build a library. However, no capital funds have been allocated in the 2018 budget’s five-year forecast to support a recreation centre in southwest Winnipeg. Councillor Scott Gillingham, chair of council’s finance committee, told the hearing that funds forecast in past budgets were removed due to changes in provincial-municipal funding agreements. Lukes asked EPC to amend the 2018 budget to change the capital funds designated for the library to recreation and to set the stage for the city to pursue funding from other government levels. A motion to amend the 2018 preliminary budget to include a new capital project titled New Recreation Facility -Southwest Winnipeg, to purchase land for the centre, and to direct $1.75-million in capital authorized for 2019 towards the southwest recreation facility, will be considered by EPC on Dec. 8. The motion was first presented to the protection, community services, and parks committee by Lukes on Dec. 4. Craig Sheldon, president of the South Winnipeg Community Centre and the South Winnipeg Action Team (a collective of community groups and stakeholders), expressed frustration at the lack of action demonstrated in the budget. SWAT has been advocating and working on bringing a recreation centre to the community for two years. “Every time there’s a letdown in the process, I feel it’s been caused by the City of Winnipeg. The lead organization responsible for recreation is the municipal government. There’s been next to no progress getting a plan established,” Sheldon said. “It feels like there’s been roadblocks and excuses at every turn. “This is critical to the citizens of our area. There are 60,000 residents who will be watching your response to this demand, who will be watching the actions that follow in the weeks and months that follow,” he said. Mayor Brian Bowman said funds from the new impact fees will help the city catch up with amenities that are lacking in new developments. “I want to provide you and residents with assurance that the commitment is there. We haven’t wavered in that recognition and we’re continuing to do what we can to move this forward,” Bowman said.